Last time we wrote about two Top 10 Lists of the most popular dogs at Dog Bark Park and as registered with the American Kennel Club. Now we’d like to mention a few breeds not as well known. The Weimaraner’s ancestry is from Germany where it is still favored as a versatile gun dog. Because of its blueish grey coat this breed is often called the Grey Ghost. The color was a challenge for us to replicate, but now we’ve found a painting technique that closely resembles the Weimaraner’s striking color. With origins from Scotland, this little dog owes its name & existence to piles of rocks erected to identify a boundary or mark a grave. Called cairns, these rock piles became favored hiding places for ground animals. Hence the need for a small game terrier that could roust out the vermin. 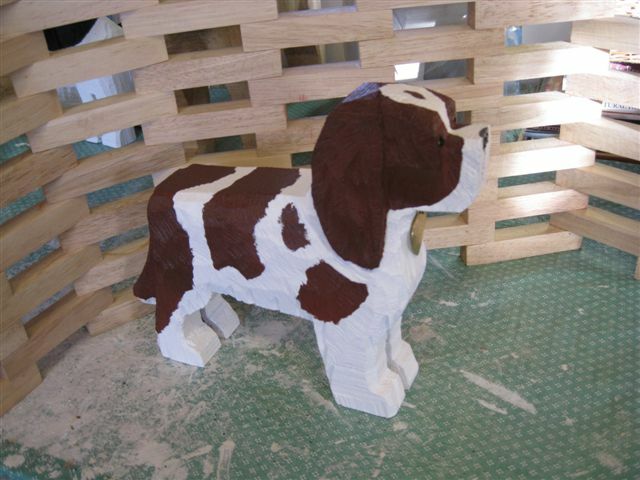 Blenheim – Chestnut red & white. Tri-Color – Black & white with rich tan markings over eyes, at cheeks & lower legs. Ruby – Rich red over the entire body. President Ronald Reagan brought notoriety to the Cavlier by often having a Blenheim on his lap during photo shoots.